Our second podcast is out now! During the European Space Week in Tallinn we had the pleasure to talk to Dallas Kasaboski analyst at Northern Sky Research and talked with him about e.g. the European New Space market, funding mentality, differences between the USA and Europe and the earth observation market. We learned a lot and are sure you will get some insights from this episode! The podcast was recorded on the 9th November in Estonia. The NewSpaceVision Podcast series focus on entrepreneurship in the field of NewSpace in Europe and abroad! We would love to hear your feedback via our social media channels or info@newspace.vision. PS: We are always looking for interesting podcast guests! Our Newsletter#6 with a summary of the European Space Week in Tallinn was published today. If you are interested in Albrechts biweekly Update about a specific NewSpace topic please sign-up below. „Data from space is the oil of the 21st century“ said Rolf Densing (Director of Operations and Head of ESOC). I would like to take this quote as an occasion to illuminate the Smallsat Business. For a little introduction check out an articleby Utah Public Radio (the Small Satellite Conference takes place each August on Utah State University campus in Logan, Utah, USA). As you can read here the market forecast for Small Satellites is promising.In addition I have found a free report by Spaceworks for you here. It is said that more satellites are built in Glasgow than in any other European city. At least the Glasgow based StartUp Clyde Space has developed a CubeSat with ultra-sensitve „cold atoms“ to accurately map slight changes in gravity across our planet’s surface. Recently they have comissioned a ground station to be able to control and monitor the satellites throughout their journey in space. The Suisse company ELSE SA got an initial 2,5 million € funding for its ambitous Astrocast project. In 2021 they want to get 64 satellites into space to build an IoT (Internet of Things) and M2M (Machine to Machine) communication network. In contrast to Cislunar Explorers – who plan to seperate water into hydrogen and oxygen on-satellite and use it as propellant – students from Purdue University (Indiana, USA) use water itself as propellent. LISA Pathfinder was using thrusters by Busek Company who have confirmed that they have passed a critical design test for iodine filled thrusters. On 1. August 2017 PacSci (Pacific Scientific) was testing its MAPS (Modular Architecture Propulsion System) rocket motors in a sun-synchronous, 515 km polar orbit operation. Instead of tanks, valves, tubing or heaters the company uses a different technology. On September 3rd from 10am to 5pm we will start with a morning boost session together with h-aero at the DroneMastersConvention. There you can see a presentation next to the flying h-aero. The convention will take place at the Trabrennbahn Berlin Karlshorst. We have organized a limited free ticket contingent for 50 NSV attendees. They are valid for the entire event. You can visit the following drone marathon and the ceremony with the Federal Minister of Economics, Brigitte Zypries. You can find the links to tickets which are free for the first 50 attendees in our Meetup group. a lot is going on in the NewSpace sector nowadays and there are many opportunities in front of us. 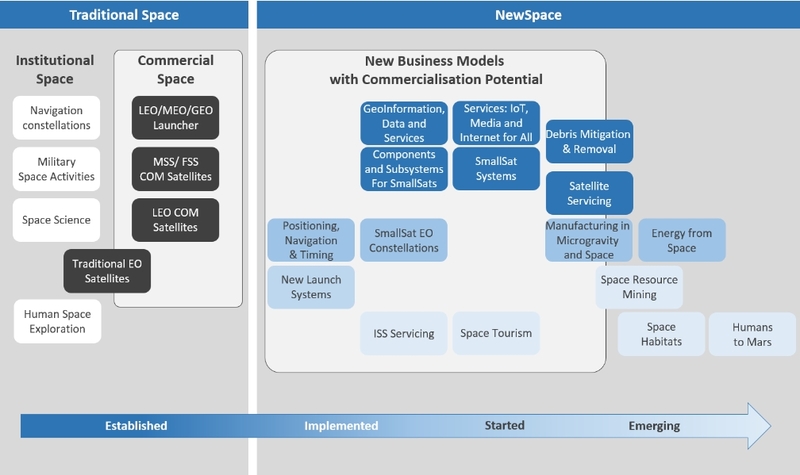 That is why we are planning to publish this content fortnightly in which we highlight a few NewSpace topics with a focus on the European Sector. This time we are going to focus on funding. Rocket launches are getting cheaper and cheaper. Orbex, a European space launch company based in UK, developed an innovative fuel tank architecture. The new technology could reduce the dry mass by 30% compared to traditional technologies. In July 2017 Orbex won the Horizon 2020 SME Instrument award. Orbital Access brings objects into space in a different way. They will use a fully re-usable horizontal take-off launch system with maximum payloads of 500kg. They recently got a 200.000€ contract with ESA as part of its Two-Stage-To-Orbit (TSTO) technology program. Furthermore Orbital Access announced that they will open a headquarter in Malta in a few weeks. From a geographically perspective a wise decision. ThrustMe is developing an electric propulsion that is more efficient than still existing ones. They claim to be able to double the thrust of a regular miniaturized electric propulsion system at only 40 percent the size. ThrustMe raised 1.7million€ from Kima Ventures and a collection of U.S. and European angel investors. A good message from Africa, especially considering a space topic. It makes me smile when I read that Ghanasat-1 was released from the ISS at the 7th July 2017. „It has opened the door for us to do a lot of activities from space,“ the product coordinator Dr Richard Damoah said. Hopefully there is still a lot to come.